This page is currently under construction. Please check back at a later date for the finished page. One of Brandeis' shining traits is the number of community spaces built by students. Community spaces are dedicated to both shared experiences and sharing experiences and include gender, sexuality, race, ethnicity, and ability. This is in no way meant to be an all inclusive list of identity-based clubs at Brandeis, nor is the Queer Resource Center affiliated with anything but the Gender and Sexuality Center space. We cannot guarantee that all of the clubs listed will not do queerphobic or transphobic things. Triskelion is Brandeis' premier LGBTQ/ Queer group and is focused around social events. It is the umbrella group that hosts SASS, Trans Brandeis, QPOCC, and Shalem. QPA is the only club on Brandeis's campus solely devoted to LGBTQ Political Advocacy. 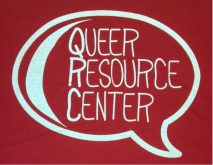 The Queer People of Color Coalition (QPOCC) interrogates issues at the convergence of gender, sexuality, and race. Considering other phenomena such as class statues, nationality, and ethnicity, QPOCC strives toward an understanding of how various social, economic, and political phenomena complication notions of race and queer identity. Shalem is the Jewish branch group of Trisk. They are also associated with Brandeis Hillel. Join us for various events and discussions about what it means to be queer and Jewish! BDSA is a chartered club that works to support the disabled students on this campus and to fight ableism in all its forms. BDSA is an intersectional group which hopes to work with other minority groups on campus to explore how disability and ableism impact us all uniquely. Active Minds at Brandeis aims to educate our community about mental illness and decrease stigma surrounding those illnesses. The Brandeis chapter is part of the leading nonprofit organization that empowers students to speak openly about mental health in order to educate other and encourage help-seeking. Brandeis Food Allergies and Digestive Disorders Association is a newly recognized club that is bringing awareness and activism to the campus about allergies and digestive disorders. Part of their work is contact with Dining Services to improve options for eating on campus.